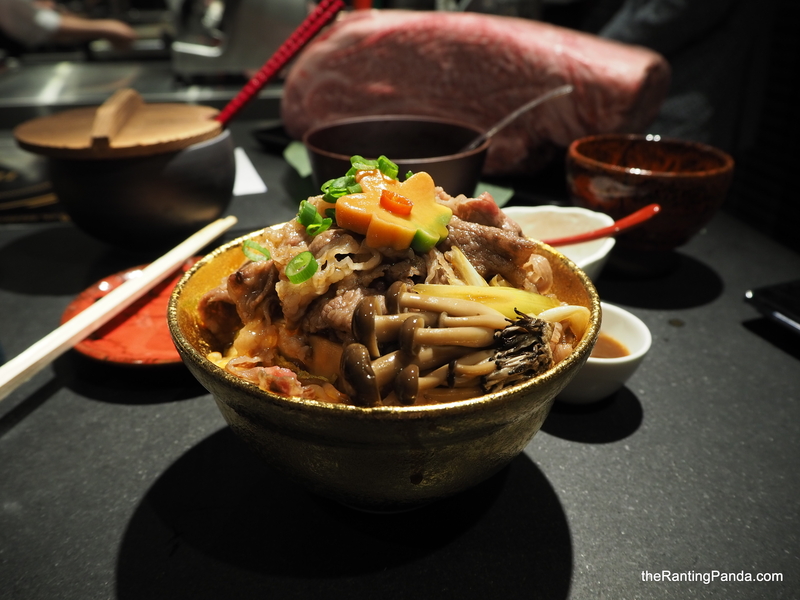 The Place Located at the corner of Tanjong Pagar estate, the latest and fifteenth concept of Keisuke Takeda brings together two favourites – Beef Sukiyaki and Gyu Don. Behind some of our favourite Japanese casual dining concepts in Singapore, including Teppantaki Hamburg Nihonbashi Keisuke Bettei and Tendon Ginza Itsuki, the newest Beef Sukiyaki Don Keisuke offers a dining experience unlike its earlier offerings as your orders are not just prepared ala-minute, it is done right in front of each and every diner. Small space with just 14-seater, and they are all counter seats, so do expect the usual queues as with Keisuke’s other restaurants. The Food Basically, the Beef Sukiyaki Don combines Beef Sukiyaki and a Gyu Don concept into one. It is apparently an ideal which originated in Japan’s Osaka, with Keisuke continuing with his venture to bring in Japanese soul food into Singapore at affordable pricing. Fret not, the decision-making process here is easy, simply decide between US Prime Beef or Japanese Wagyu Yonezawa Beef. Both don will come served with 120 grams of your selected beef slices, topped on Koshihikari rice prepared with Donabe rice cooker. Finishing off the don, you will have Shimeji Mushrooms, Tofu Braised in Sukiyaki and Shirataki. As expected of Keisuke, the kitchen complements the don with a side of Sesame Tofu in Dashi Ankake Sauce, Onsen Egg, and Traditional Miso Soup. And while waiting for your food to be prepared, you can enjoy a unique pickle here, prepared with pumpkin, beetroot and gobo. The affordable option, the Beef Sukiyaki Don (S$13.90) gets served using US Prime Beef Chunk Eye Roll and everything mentioned above. Yes, it is going to worth every penny spent. And if you would like to go for more of the beef, top-up S$10 for an additional 120 grams. For the premium option, the Kiwami Wagyu Sukiyaki Don (S$29.90) is served in a shiny gold bowl instead of a silver bowl – the Japanese focus on details always awe the Pandas. The don is prepared with Yonezawa A4 Beef, with top-up option available too, at S$25 for an additional 120 grams. Each order is prepared ala-minute, but you might not have time to sit back as the chef prepares your don in front of you. Starting with the sukiyaki sauce, the chef will have the 120 grams of beef slices done medium. Once readied, the beef slices are topped on the rice which the kitchen prepares upon each order. The sides are served together with the completed Sukiyaki Beef Don, and all extra sukiyaki sauce are poured into a small bowl should you like the sweet sauce. Rants Why does it only has 14 seats? Why not more? Will I Return Again? A resounding yes. Admittedly a beef lover here, but the juicy tender Wagyu don is worth every calories. Of course, if budget is a concern, your dining experience itself with the more affordable Prime Beef Sukiyaki don is not going to be compromised – you get everything, except the Wagyu Beef slices.